A much-awaited smartphone coming to Sprint is the HTC EVO 4G LTE and today we have news of a release date of May 18. This date is subject to change as with most smartphone release dates but the signs are looking promising and we think this one will fly off the shelves on launch day. The HTC EVO 4G LTE is Sprint’s LTE variant of the HTC One X, the current flagship device that’s sweeping the globe and many users are waiting to get their hands on it. Of course although the EVO 4G LTE is one of Sprint’s first LTE-equipped phones, its LTE network is not yet up and running. We can only imagine that the network will go live soon but even so, when it does arrive only small parts of the US will be covered initially. For now then, 4G LTE devices on Sprint will have to use the 3G network. 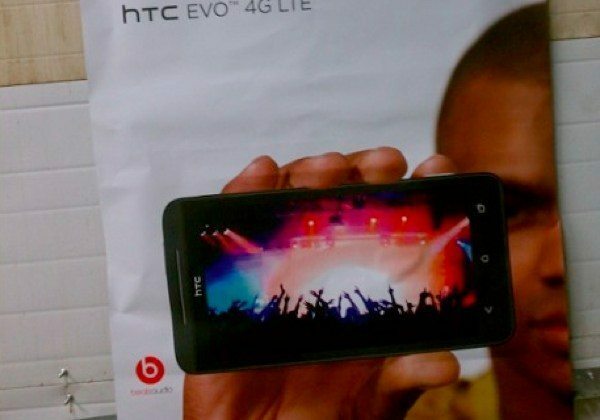 We have already posted many details of the HTC EVO 4G LTE including an official pre-order date of May 7 but news of a release date shortly afterwards will undoubtedly please many potential customers. May 18 has been bandied about once or twice previously as a possible release date and it seems all but confirmed following a new report. Gotta Be Mobile tells how GoodAndEVO has quoted a reliable source for the May 18 release date and that this source has a proven record of credibility. As well as a release date GoodAndEVO revealed some marketing materials for use in Sprint retail stores. The HTC EVO 4G LTE will replace the HTC EVO 3D and if you want a recap on specs and features we can tell you it has a Snapdragon 1.5GHz dual-core processor, 4.7-inch Super LCD HD display, 1GB of RAM and 16GB of storage. It also offers an 8-megapixel rear camera with HTC ImageSense technology and ImageChip and a 1.3-megapixel front-facer and it will be running on Android 4.0 ICS, have NFC support and a 2000mAh battery. The HTC EVO 4G LTE is priced at $199.99 on the usual two-year contract. If you want to see more then check out a hands-on video of this smartphone below our story. You can also see the Sprint product page for this phone here. We’d like to hear from readers using Sprint who may be tempted by the HTC EVO 4G LTE. Are you waiting for this impressive handset? If so, what has made you choose this smartphone over other upcoming Android phones such as the Samsung Galaxy S3, due to be unveiled on Thursday? I’m looking forward to upgrading from the original EVO to the EVO 4G LTE as soon as it’s available.Â Although it irks me somewhat that I’ve never benefitted from the 4g speeds, the phone itself worked very well for me despite the abuse I’ve given it over the years.Â I’m a little concerned about the battery life as I’m used to swapping out a dead battery for a fresh one when not near an outlet. Hopefully there will be some charge-to-go options.Â Of course, I will check out the new Samsung, but I guess I prefer the HTC since I’ve been using it for the past 3 years. My wife and I both own the original EVO’s since day 1, and are really itching for this phone. Â We both were able to upgrade last year, but we both didn’t like the EVO 3D. Â Played with the SGS2, passed on that as well. I agree with Mslioness, we are VERY irked about the 4G rollout that never happened. Â This is TRULY Sprint’s last chance. You gotta remember that the Original EVO used Clearwire’s 4G network that Sprint paid to be able to access. Sprint had limited input on where the network was being built and in many cases the tower sites in highly coveted areas, such as your upper middle class area I suppose, are banned from being built by the communities or municipalities that see a big pole in the air with equipment attached as an eyesore. So maybe check locally to see if that is the case and then you can work to change it. But Sprints own LTE roll out which they dub Network Vision will be built on there already existing towers and will work in conjunction with Clearwires LTE rollout so hopefully if you have a site close you may be able to get LTE by year end. I am a “Ride or Die” Evo fan for sure!Â But, all of thisÂ hype is only warranted if the battery issues have been resolved with thisÂ feature packed EVO!! Embedded battery is a deal breaker. I never leave the house without a couple of spares for my EVO 4G–it’s a battery sucking pig. Why would they release this version without that capability? I am definitely getting the Evo 4G LTE. I love the sturdiness of HTC phones and the feature rich experience they bring. I’m pumped about this phone…I might even buy out-right instead of waiting for my upgrade. Keep the bar high HTC and Sprint!!! They already have “on the go” charging options. Â It basically is a device that has a pair of AA batteries with a wire coming out that has a microUSB end. Â No worries either folks, the One X people have experiences pretty great battery life (12 – 15 hours) and our battery is bigger. Can’t wait for May 18th – they better not push that date back on us! I love my original EVO.Â I ended up buying a 3500 mah battery from amazon that has worked very well.Â It makes the phone much larger but the battery life is at least 10 hours.Â Been wanting a larger screen.Â Was hoping sprint would pick up the note.Â Looks like they will just skip to the S3.Â I can’t get a new phone till august, until then, it will be interesting to see how these two phones compare.Â I lean toward the EVO but it sounds like the specs for the S3 might be a little better.Â Can’t wait to test them both out.